Arts Management is designed as an upper division undergraduate and graduate level text that covers the principles of arts management. 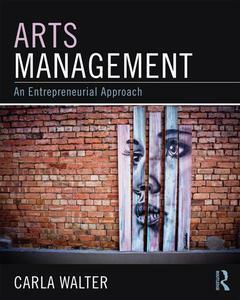 It is the most comprehensive, up to date, and technologically advanced textbook on arts management on the market. While the book does include the background necessary for understanding the global arts marketplace, it assumes that cultural fine arts come to fruition through entrepreneurial processes, and that cultural fine arts organizations have to be entrepreneurial to thrive. Many cases and examples of successful arts organizations from the Unites States and abroad appear in every chapter. A singular strength of Arts Management is the author's skilful use of in-text tools to facilitate reader interest and engagement. These include learning objectives, chapter summaries, discussion questions and exercises, case studies, and numerous examples and cultural spotlights. Online instructor's materials with PowerPoints are available to adopters.